This article covers long hair swim caps. If you have long hair, finding the right kind of swim cap can take some time. Because I wore shoulder-length hair as a man a few years back, I can provide you with some tips that will make the task of choosing the right kind of cap easier. Bubble swim caps are ideal if you have long hair. This one’s made by Nike. I advise you always to wear a swim cap, and especially so if your hair is longer than a few inches. While the swim cap won’t keep your hair dry, it will nevertheless protect it from the bulk of chlorine in the pool. Chlorine is very aggressive on hair and renders it brittle. This can quickly become problematic especially with long hair. Additionally, without a swim cap, long hair quickly gets in the face while swimming, and it is no fun to swim in this fashion. Swim caps come in a few different materials. With long hair, you’ll want to avoid lycra swim caps. Lycra swim caps don’t provide a tight fit and will most likely slip off quickly if you put your head under water. This leaves us with latex swim caps and silicone swim caps. Both kinds provide a tight fit and work with long hair. However, if you are allergic to latex, you’ll want to choose a silicone swim cap. As you can see, the bubble swim cap has plenty of space left to tuck under long hair. 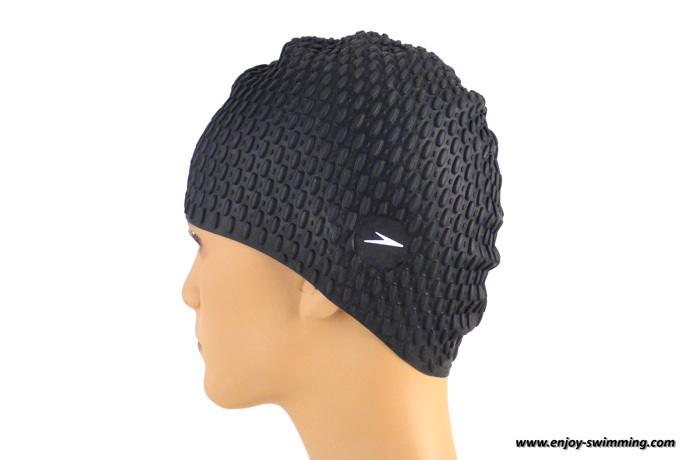 Long hair swim cap: this is pretty much the standard swim cap where the borders are a little bit longer. Most girls I see at the pool wear this kind of swim cap. They make a bun with their hair and then slide the swim cap on top of it. However, it didn’t work well with the shoulder-length hair I had a few years ago. Bubble swim cap: bubble swim caps, as their name implies, have their surface is covered with small bubbles. They are usually larger than regular swim caps, and that’s why it’s easier to fit in long hair. While their look may not appeal to everyone, that’s what I recommend if you have long hair and want to fit it safely under a swim cap. That’s the option I successfully used a few years back. 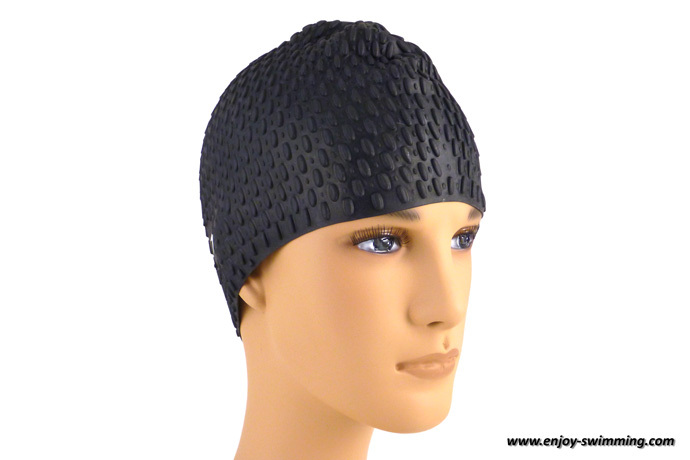 The best option for a long hair swim cap is the bubble swim cap. Even if its look is a little bit peculiar, it works very well with long hair.